Warwick Castle was built in 1068 by William I (the conqueror) as a plan to safeguard the Midlands before he fought the enemies in the North of the country. It is one of the most picturesque castles in England. My daughter and her family live close by so it is only natural for us to spend some time there. The entrance leading to the castle is magnificent. The drawbridge was built (it would have had water below, but now is dry) as a safety precaution, before reaching the gatehouse. Then the portcullis could be lowered against attackers. It is small and was built by Sir Fulke Greville in the 17th century. The brass chandelier is Polish and dates back to 1700. There is a beautiful woodcarving of “The Battle of the Amazons” with so much detail. The stained glass windows and the chandelier by the alter are breathtaking. This is a newer part of the castle dated 1763. The fine ornate gilded ceiling is in the Jacobean style and was done my Robert Moore. A wonderful Adam period fireplace has a picture of 2 lions above it. At one end is a picture of Charles I, which dominates the room. The furniture is English and Italian. The armchairs are walnut parcel-gilt. The table Victorian and the chairs English. An 18th century fine cut-glass chandelier hangs from the magnificent ceiling. This is by far the largest room in the Castle. It is 62 feet long, 45 feet wide and a height of 40 feet. Wow, it knocks you back to see it. This room contains around one thousand pieces of arms and armor. I must take a minute to tell you about this one. This is supposed to be haunted by the ghost of Sir Fulke Greville. His manservant murdered him in a horrible way. As we walked though reading the literature I became cold and could not wait to get out. I do not believe in ghosts but boy, a chill came over me. This would be a place for little ones to avoid. My husband Len and I waited a long time to go and view it. It was dark, damp, and Len felt closed in. I checked it out but he had to leave the area. What I loved the most was the grounds. They are sheer perfection. The grass is so green and well maintained. The flowers, shrubs and trees are so beautiful. We found a little kiosk and bought sandwiches and drinks, and sat down to take full advantage of the scenery. In the grounds you can check out the Conservatory. Peacocks will dance in front of you. Everyone can stroll at leisure and take in the entire beauty. Take a walk down to the Victorian Rose Garden, or the Rock Garden. I can truly say this was a day my family and I will never forget. If you are young or middle aged this would be great for you. For the elderly I think it may be too much. There are an awful lot of steps in the castle, as well as the grounds, which would spoil the day. I strongly suggest that you allow a whole day for this visit. There is so much to see, I have only listed some of the areas for your enjoyment. To get to Warwick, take the M40 to exit 14. From here it is sign posted. You may also wish to stay a couple of nights and check out Stratford-upon-Avon. However, I would suggest finding a hotel or bed and breakfast in Warwick, they are a little cheaper. We stayed at the Chesterfield’s bed and breakfast and you may want to avoid it. Thank you for visiting one of the most amazing castles with me. If you don’t have time to go into the castle, but are in the area, you can get a really good view of it from the bridge. Take lots of video and photographs. 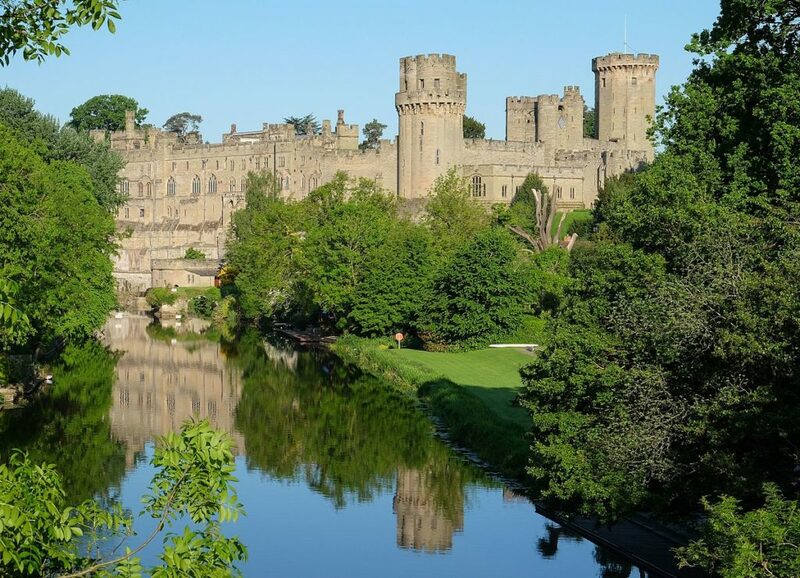 Warwick Castle is part of the Great British Heritage and you can purchase a day visit for 13 pounds 95 pence ($28) for an adult or 38 pounds for a family ($76).